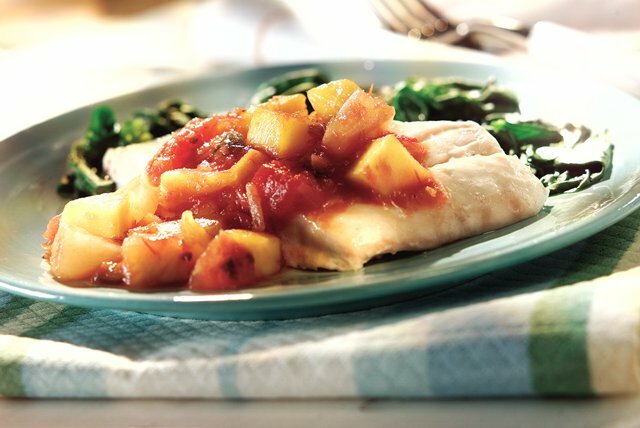 Fish fillets are placed over fresh spinach leaves, topped with a zesty tomato, mango and pineapple salsa then baked for a light and delicious entrée. Mix salsa, pineapple and mango. Place spinach evenly in 13x9-inch baking dish; top with fillets. Spoon 2 Tbsp. of the salsa mixture over each fillet; cover with foil. Set remaining salsa mixture aside for serving with fish. Bake at 450°F for 15 minutes or until fish flakes easily with fork. Serve with reserved salsa mixture.